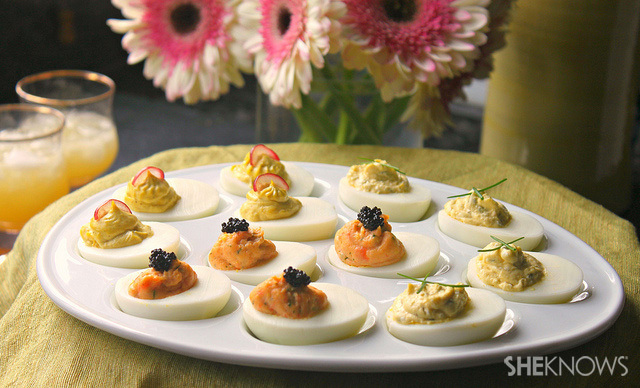 Make a bold and beautiful statement at your next party or brunch with a tray of these tempting deviled eggs! Six hard-boiled eggs and three small bowls is all you’ll need to get started making these beautiful and delicious deviled eggs three ways! Smoked salmon and dill, feta and capers and curried deviled eggs, make for an eye-popping presentation, while wowing them with flavor! These recipes yield one dozen deviled eggs; four of each kind. Peel off egg shells and neatly cut the eggs in half lengthwise. Carefully remove the yolks and place them into a small bowl and mash the yolks down with the back of a fork. Fill egg whites neatly with the smoked salmon and dill mixture. Top with caviar and serve or place in the refrigerator until ready to eat. Fill egg whites neatly with the feta and caper mixture. Top with fresh chives and serve or place in the refrigerator until ready to eat. Fill egg whites neatly with the curried yolk mixture. Top with a slice of red grape and serve or place in the refrigerator until ready to eat. You can either very neatly spoon the yolk mixture into the egg whites or place the yolk mixture into a small, zip-closed bag, clip off a corner of the bag and then pipe the yolk mixture into the eggs. The latter makes for a more elegant presentation.